As we are a partner lodging of the Ötztal Premium Card you receive this magic Holiday Pass the moment you check-in. And what's best, all highlights and must-sees in Ötztal are already included! 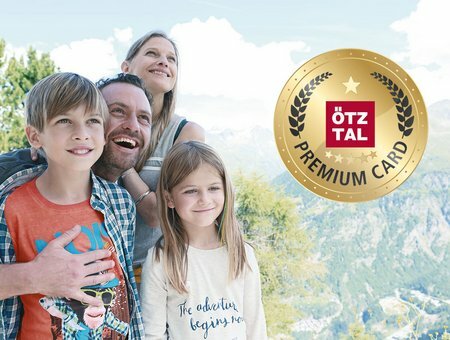 Explore, enjoy, experience the valley in all its facets – Ötztal Premium Card holders enjoy heaps of benefits. Experience the full variety of summer. Ötztal really has a lot to offer. Scenic Ötztal valley boasts infinite opportunities for walkers, hikers and alpinists. Leisurely walks lead straight through lush Alpine meadows in full bloom or along old Waalweg irrigation ditches. Individual travelers and families can choose from incredible 1800 km of signposted hiking trails and Alpine paths. A stopover at one of the quaint mountain huts is an absolute must - enjoy a hearty snack to restore your energy. Lift-assisted hiking is available as well thanks to the summer mountain lifts which are free of charge for Ötztal Premium Card holders. Splendid glacier fields, high Alpine landscapes, moorlands, idyllic mountain lakes, rushing brooklets, ancient stone pine or larch woods line the picture-book routes within the giant Ötztal Nature Park. It is Austria's third biggest nature preserve covering about 510 km². As we are a partner lodging our guests can take part in varied guided hikes and events for free. Trails and Lines in abundance! 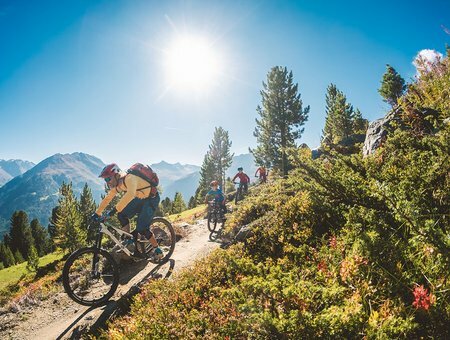 Sölden in Ötztal has already become one of the unrivaled hot spots when it comes to trail biking, enduro or all-mountain riding by founding the ultimate Bike Republic Sölden. Mountain bike enthusiasts especially appreciate the huge choice of thrilling trails and lines for all ability levels. But also classic mountain bikers, E-bikers and sporty families are warmly welcome to a trail network of 700 kilometers - ranging from challenging single trails to easy forest routes for all ages. Another highlight of the Bike Republic Sölden is the "ROLLING" Pump Track at Bäckelarwirt next to the Gaislachkogl base station, one of two splendid bike parks in the village and just a few turns below Aliona Apart. Here you can test and improve your biking skills before you hit the more demanding trails. Ideal for beginners and children. Sölden in Ötztal is one of the new hot spots for avid trail fans, enduro bikers and freeriders. Here you will find superb flow trails and shaped lines - be it blocky or speedy, they all promise endless biking fun.